Founder of de Gournay, Claud Gurney spills the secrets to mixing and matching patterns at the home. 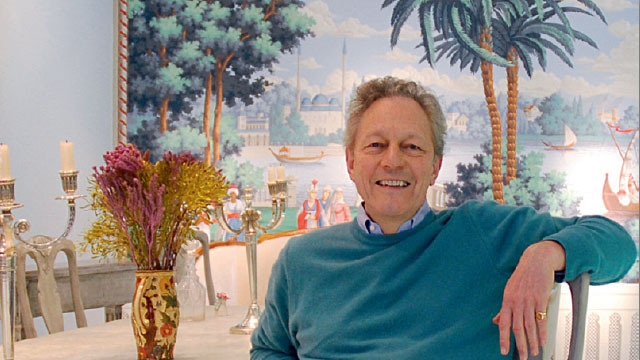 Claud Cecil Gurney doesn’t just make wallcoverings. 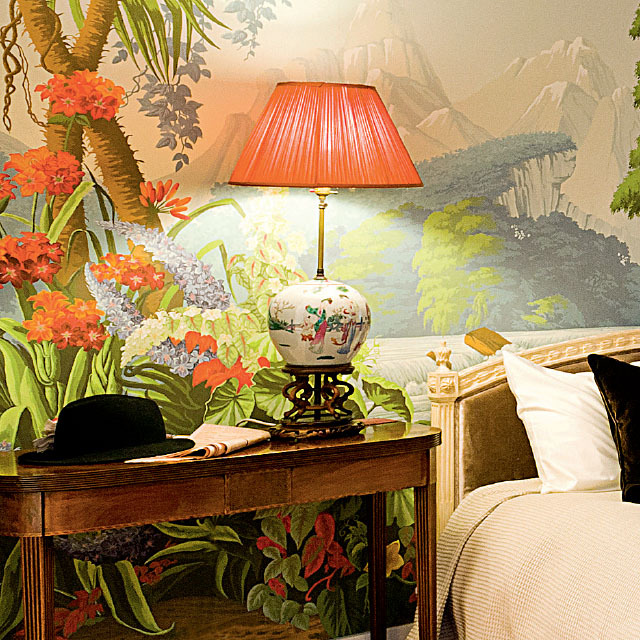 Since 1986, his London-based design firm de Gournay—the original medieval spelling of his family name— has been creating extravagantly painted panels that transform the rooms they inhabit into works of art. 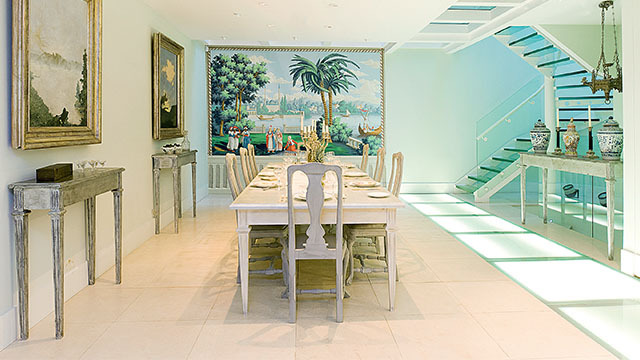 From commission to conceptualization, all the way to installation, the process of a de Gournay bespoke interior is fascinating and has more in common with the curation of fine art than it does with decorating. 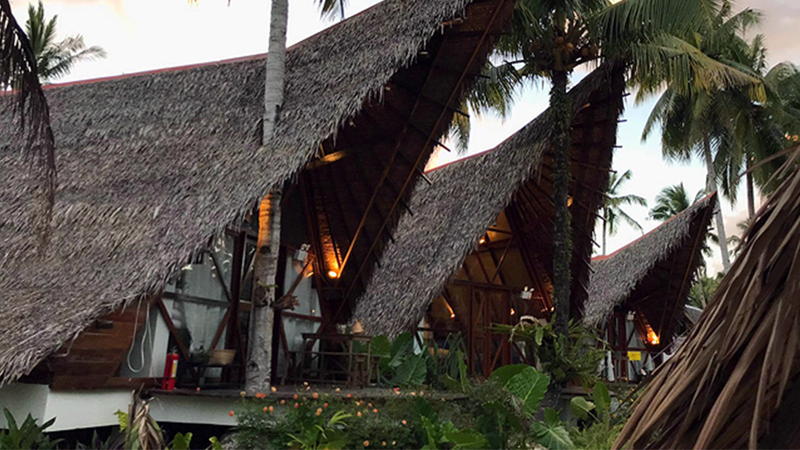 The design firm’s creative expertise, unique understanding of original technique, and the unparalleled skill of the painters and craftsmen are evident in every custom creation. 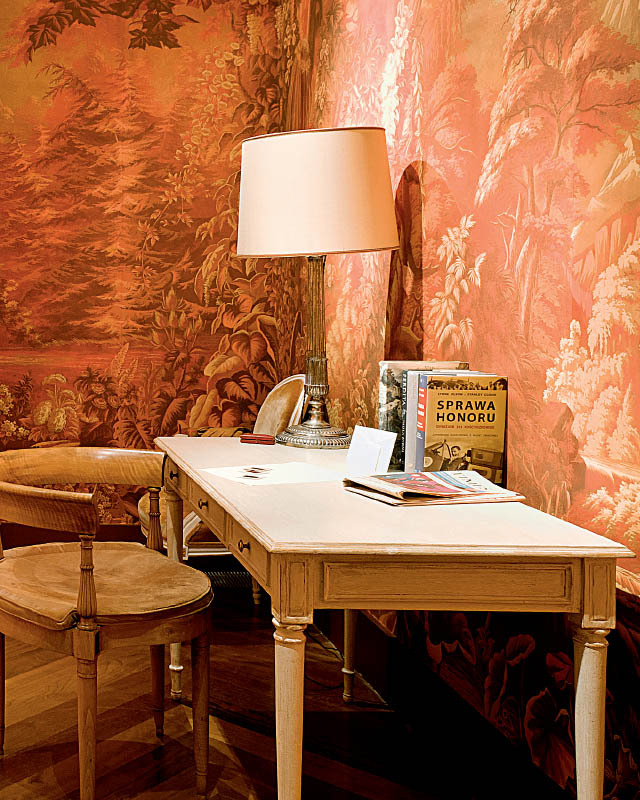 Specializing in the recreation of 18th-century Chinoiseries and 19th-century scenic murals, they have become one of the most desirable producers of custom luxury wallpaper, fabrics, porcelain, and grand siecle furniture and accessories. 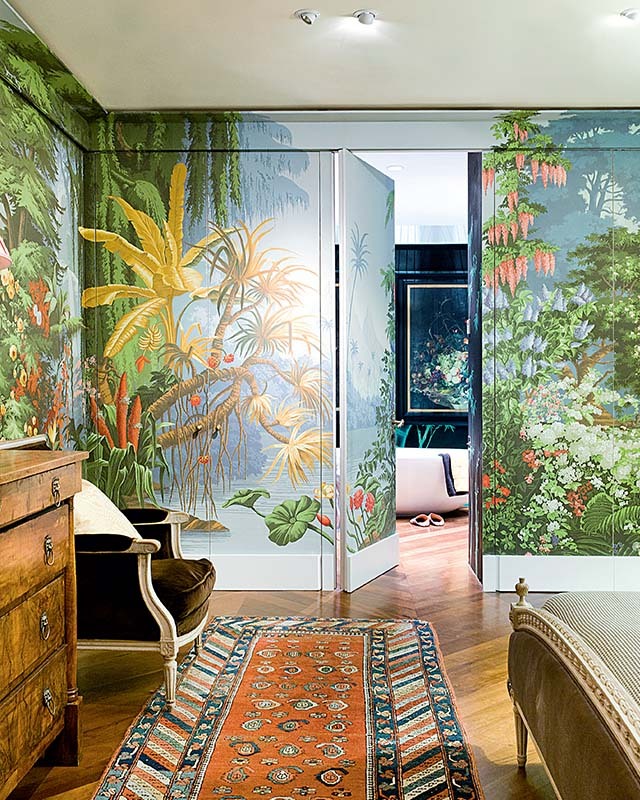 A favorite of leading interior designers and architects, de Gournay’s hand-painted images of flora and fauna, landscapes and collection of Japanese and Korean silk screens and kimono motifs can be found in impeccably designed homes, boutiques, restaurants, and hotels around the world. Having also worked closely with fashion houses in creating garments and accessories, the house has created designs that have appeared in collections of Matthew Williamson, Lulu Guinness, Dosa, and Jenny Packham. 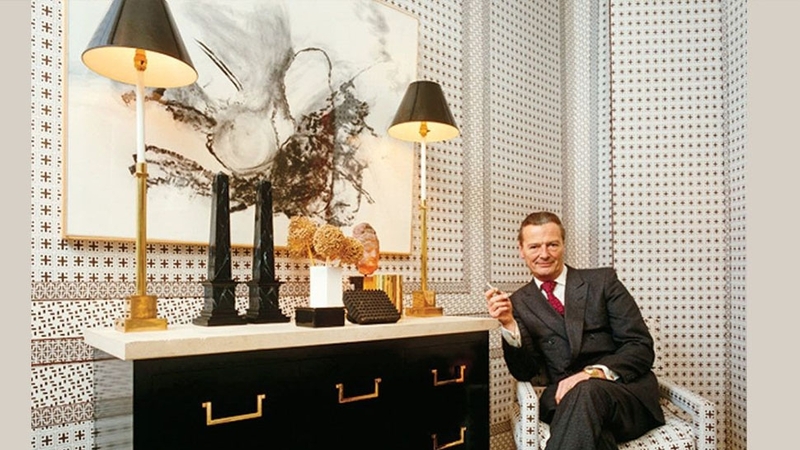 When not traveling between London and his showrooms in New York, Paris, Shanghai, and Moscow, Gurney, with his dog Lollipop, divides his time between a countryside home in Kent, and his renovated London Mews townhouse in Chelsea that as one would expect, is wrapped from top to bottom in bold, elegant, and mesmerizing de Gournay. 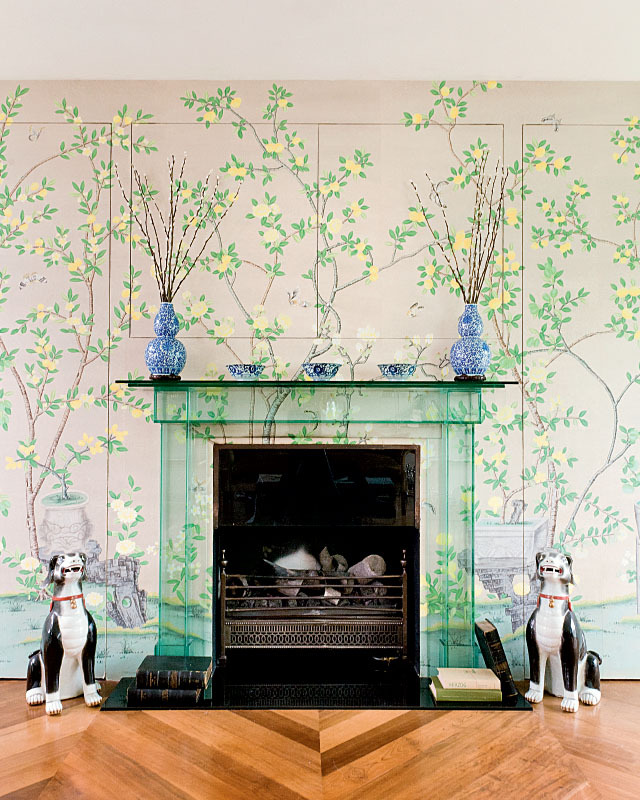 The fireplace gets the de Gournay treatment. 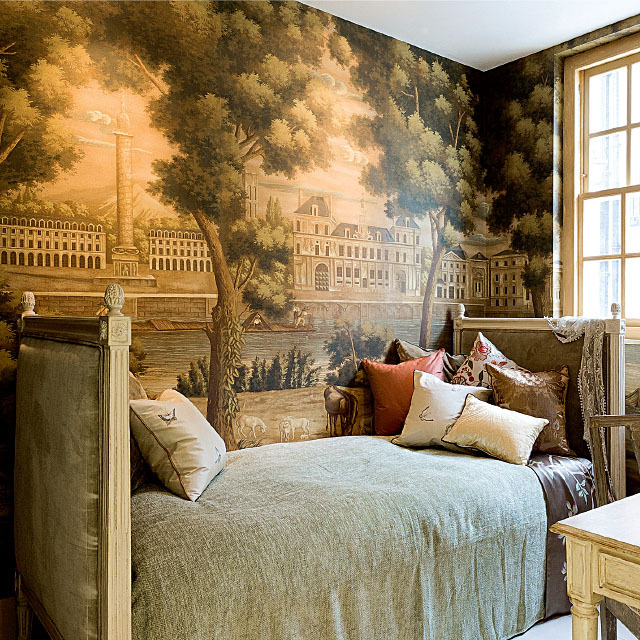 Monuments of Paris, a fine example of intricate handpainted wallpaper in the guest room. 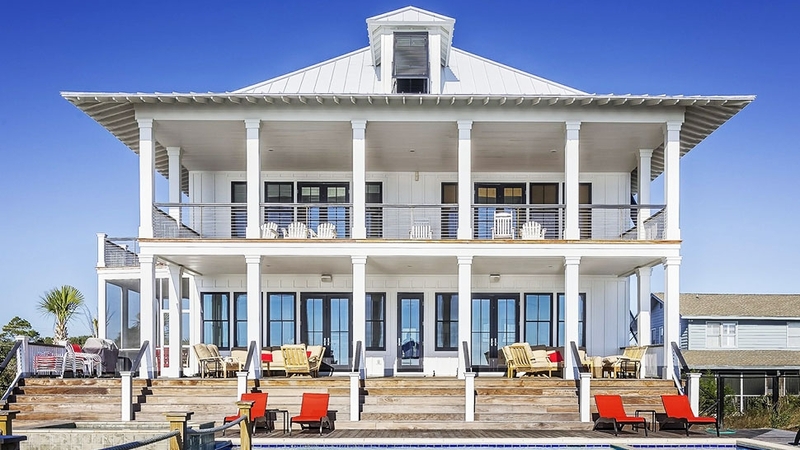 How does this home differ from your other residences? My other houses are very much more traditional and classical. The Mews House has a slightly contemporary, empty, and light look to it with some decoration added. 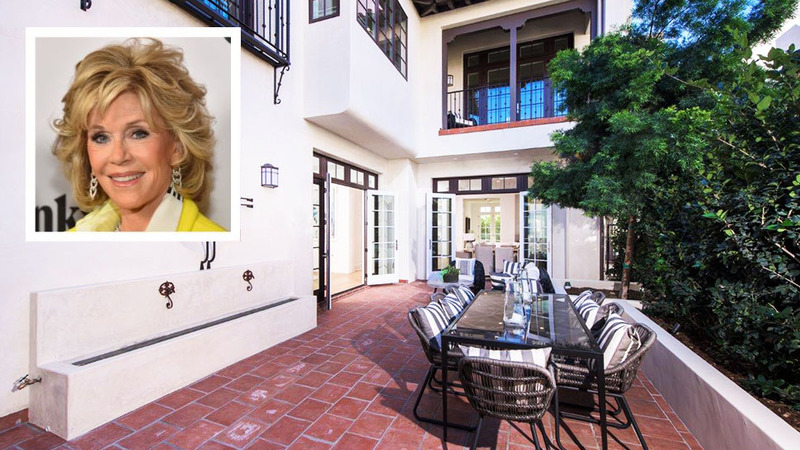 It is such an elegant and timeless home. What do you think gives interiors lasting appeal? I am not sure that it is timeless, but I think that “lasting appeal” comes from using high-quality materials and avoiding “fashionable” colors. So no avocado bathroom suites and no reproduction Victorian tiles, no vanity units and no basins inset into Corona, to start off a very long list. 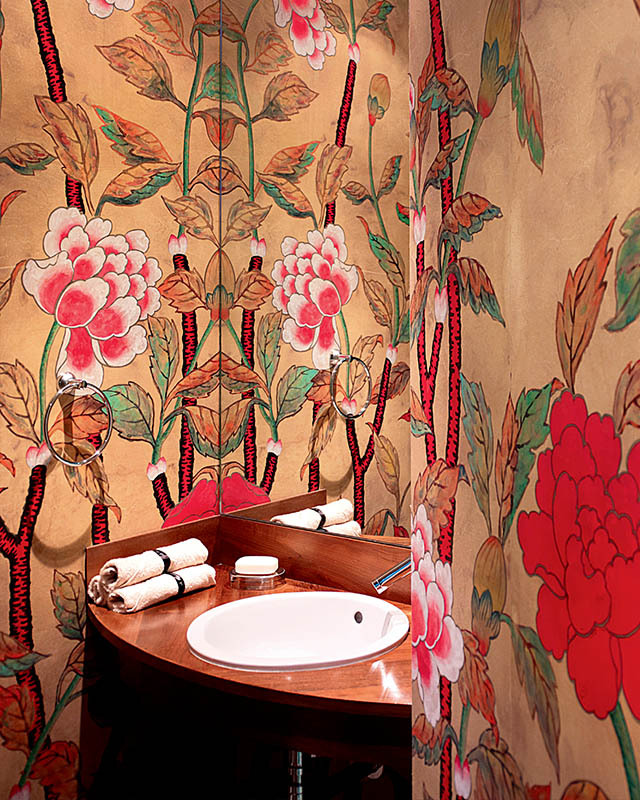 The powder room is adorned in a Korean Peony motif. So, how then would you best describe your aesthetic sensibility? I do not think of myself as a designer or an artist, although I try to have an east/west aspect where possible. What inspired your palette and décor? I try things, make mistakes, and try again until I feel happy with the result. 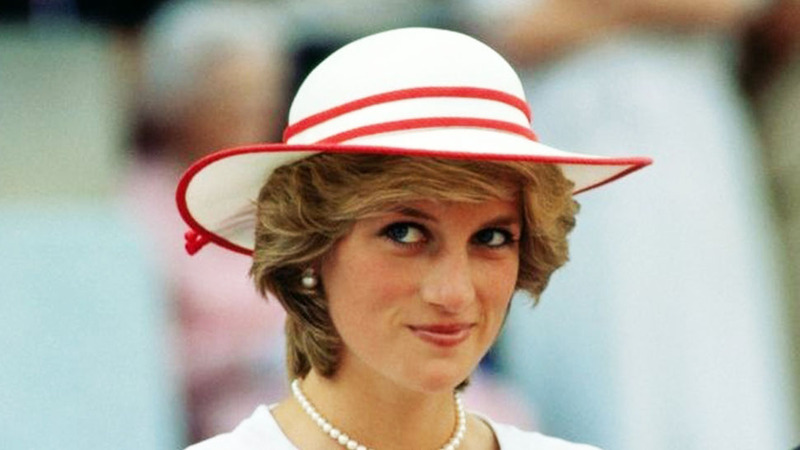 Like Churchill, I am “easily satisfied with the best” and I know when I have got the best because my aesthetic sensibility if I have one, tells me so. The small study adjacent to the master bedroom in handpainted L'eden Coral. The dining room shows off de Gournay's other specialties: customized scenic mural "Rives du Bosphore," porcelain, and grand siecle furniture and accessories. You have used so many patterns, from the wallpaper to the fabrics. Is there a secret to mixing patterns successfully? Never attend a school that claims to teach you about decoration. I hate any attempt to produce mood boards to show how colors “match.” Even worse are sample books that show “matching” fabrics and wallpapers to some paint one has chosen. Avoid these at all costs. 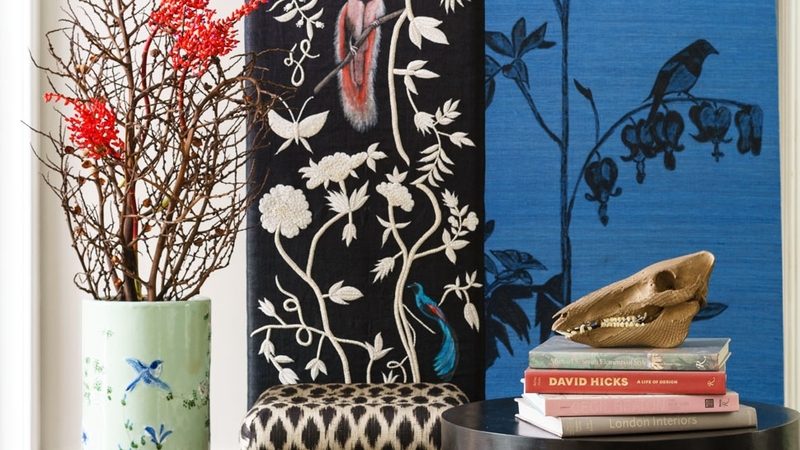 Just visit 18th-century houses where one will find different patterns on the rugs, the tapestries, the curtains, the upholstery, and the walls yet which all look wonderful together. It is so easy to be a designer if one uses black and white or creams and browns but the result always looks like a posh hotel. Be bold with colors and if it doesn’t work, change it. 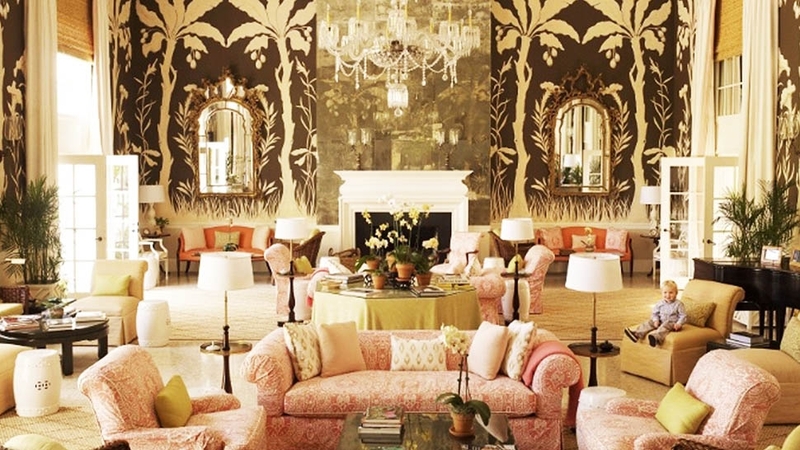 There are very few designers who understand color—Manuel Canovas, Alessandro Gioia, and Duarte Pinto Coelho are the three who have inspired me and who all loved de Gournay’s work. 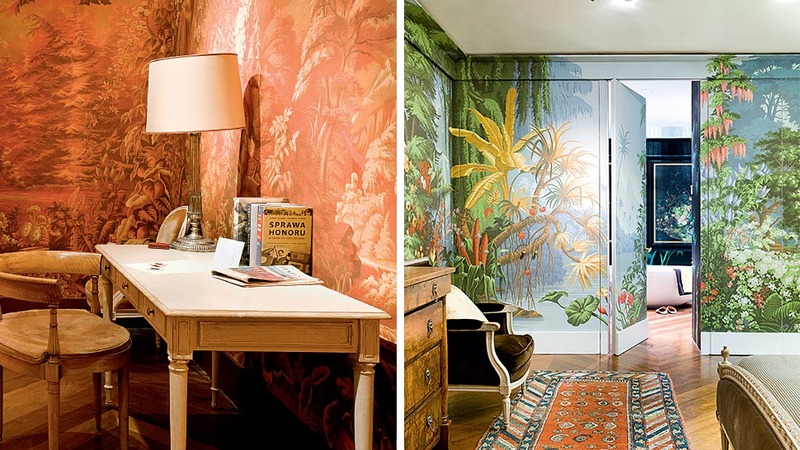 As expected, Gurney's master bedroom is plastered wall to ceiling with his highly sought after wallpaper—in this case featuring a lush tropical forest theme. Gurney's hand-carved Louis XVI Lit bed is upholstered in Argento silk velvet. More or less formal depending on how many staff members are available but I always mix different nationalities and sexes and ages. The idea of middle-aged bankers gives me the shivers no matter how “successful” they may be. Comfortable, colorful, and made to measure—never from a fashion house. My work destinations are my travel destinations most of the time—London, Paris, New York, Moscow, Shanghai, Istanbul— and if I get time I just explore wherever I am. 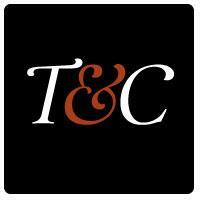 Tretyakov Gallery in Moscow, but avoid the early paintings of Czars. For me, there are no other people with more vibrant, sensual, and spiritual paintings than the Russians. They express life’s struggle between good and evil and rich and poor in the most poignant way possible. Fresh fruit from my garden, and also bottled/preserved fruit from my garden—apricots, peaches, plums, greengages, apple puree, pears, and many other fruits. Boxes of Pakistani mangoes or Madagascan lychees. Mussorgsky, Mozart, Beethoven, Chuck Berry, Crystal Gale, Johnny Cash, and Elvis Presley. Alexander Ivanov, Ilya Repin, Karl Brullov, Ivan Shishkin, Valentin Serov, Vasily Pukirev, Vasily Perov, Philip Malyavin, Vasily Vereshchagin, Kuzma Petrov-Vodkin, Marc Chagall. There are so many. Every other gallery I visit is a mixture of everything but this is a pre-expression of Russian vitality and exuberance and there is not a painting I would not love to have at home. I plant lots of trees and my balance is certainly positive but I do not do it to be green. As an economist from the University of Chicago, I am constantly amazed at how incapable the government seems to be at setting the right incentives. I suppose that I should not be surprised that the personal interests of politicians are more important to them than the environment but it sometimes saddens me. Double cream, fresh fruit (I guess one has to add “tree-ripened” these days), man’s best friend, porridge for breakfast, a freshly laundered and ironed shirt every morning, my wife who divorced me, and my heart pills, literally. At my country house with all four of my children and as many friends as they can bring, eating, arguing, walking, and riding.